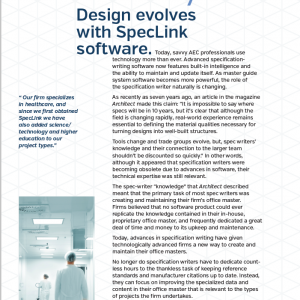 The renowned architecture and design firm adds SpecLink to their arsenal of cutting-edge tools to remain at the leading edge of innovation. 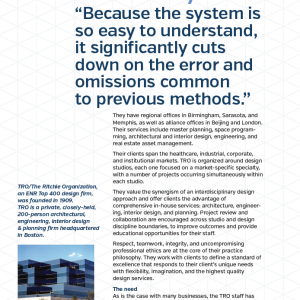 Error and omissions common to previous methods used by TRO were significantly cut down as a result of SpecLink’s easy to understand system. 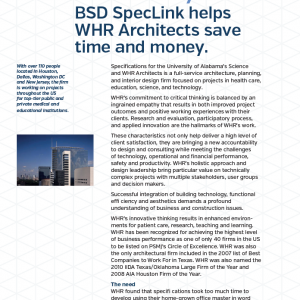 BSD SpecLink helped WHR custom tailor an office master to address the issues of the company's primary building type (health care) while maintaining a "memory" of decisions within the office master. 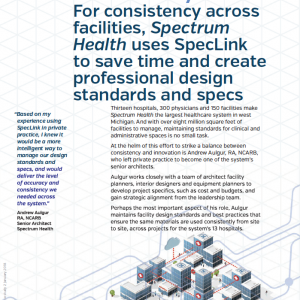 For consistency across facilities, Spectrum Health uses SpecLink to save time and create professional design standards and specs. 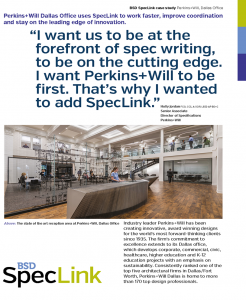 SpecLink gave WBA the ability to seamlessly assimilate a tremendous amount of client specific requirements, standards, procedures and preferences. 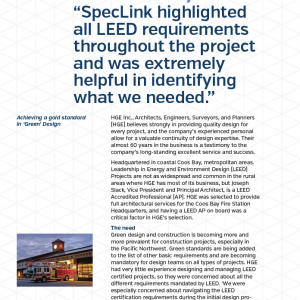 Achieving a 'Gold' standard in 'Green' design was possible with SpecLink. 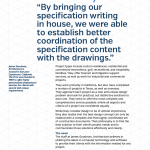 With SpecLink James Goodman Architecture was able to bring specification writing in house and establish better coordination of the specification content with the drawings. 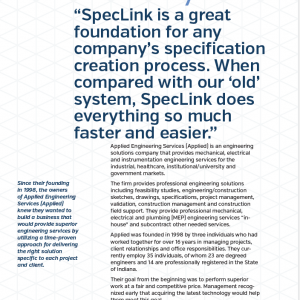 Bringing SpecLink technology on board helped Applied Engineering Services deliver on their pledge to customers. 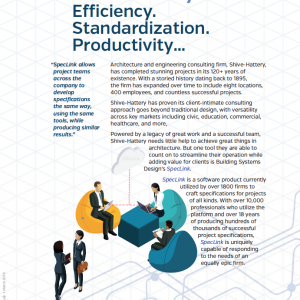 Construction administration was simplified with SpecLink, for Saratoga Associates that alone made a huge difference in how long it took to produce specifications. 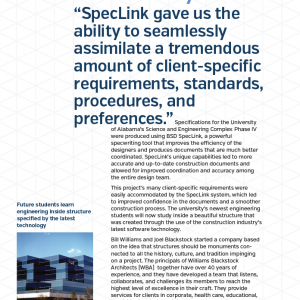 SpecLink updated their specs automatically and painlessly without disruption; reduced errors and omissions; simplified sustainable design certification; and helped them transition seamlessly from schematic to design development, using the same database. 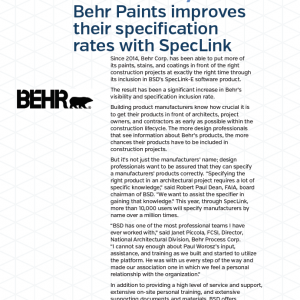 Behr Paint improved their specification rates and visibility with BSD SpecLink. With eight office locations, each office was working in slightly different ways. 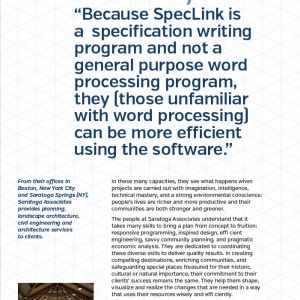 BSD SpecLink allows project teams across the company to develop specifications the same way, using the same tools, while producing similar results. 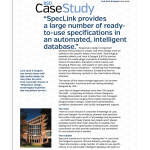 SpecLink turned out to be the "missing link" in Lord, Aeck and Sargent's process; providing a large number of ready-to-use specifications in an automated, intelligent database.